Undershirts are worn for a number of reasons these days. Most men wear them under their regular shirts for hygiene purposes or comfort. Still some like to wear them as an accessory and make sure that the undershirt can be seen. There are even some men that will wear an undershirt as their main shirt because of their style. When it comes to the number of undershirts you should own and how often you launder them really depend on your usage. If you wear undershirts under your regular shirts because of hygiene then you will want to own at least ten. This will get you through more than one week even if you don’t decide to launder them on a frequent basis. This way you won’t get caught off guard without a fresh undershirt to wear. But if you are wearing them for hygiene purposes, then you should never wear them more than one time before they get washed. Nothing says funky smell like an undershirt that has been worn more than once and sweated in. Frequent wearing and not frequent washing will also lead to your undershirts turning dingy and the armpit portions of the shirts often turn yellow. If you wear an undershirt for comfort then you should own at least five. Chances are that you will not be wearing one every day, just when you are wearing an outer shirt that is maybe extra starchy for example. As far as how often to launder them that is up to you. Most men treat an undershirt like underwear and thus wash after each use. But if you are not a sweat producing individual you could probably get away with wearing your undershirt at least two times before you definitely need to wash it. For those that wear only an undershirt –A-shirt or crewneck with jeans- for fashion then again five should suffice. Unless undershirts are all you want to wear then you should do fine with a few. Again the laundering depends on your sweat output. Since most undershirts are white then they should be washed every now and again with some bleach in the wash cycle to keep them as white looking as possible. You don’t want to be going around in a dingy grey looking shirt whether it is worn under another shirt or worn alone. Don’t assume that because it is under your regular shirt that no one can see the stains that are on it. 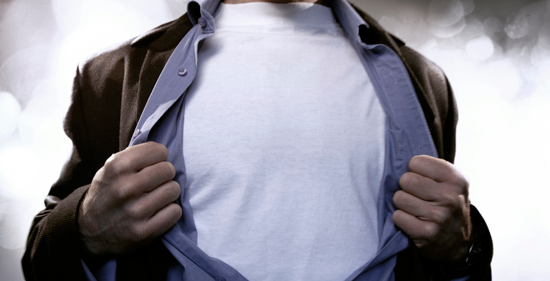 Once an undershirt has seen its better days, trash it and replace it with a fresh one. Undershirts are not that expensive and just like underwear, nothing beats a fresh one. If you are emotionally attached to your undershirts you can always save them and wear them to bed or around the house if that is your desire. Undershirts are an essential piece of clothing for many men. But remember that when it comes to how many you should have and how often you launder them; it all depends on the usage. If you don’t think that you own enough to get you by, then by all means go out and buy a few more. In this case too much is better than too little.